An activist from Animal Rights Cambridge arrested for a protest inside the McDonalds restaurant was this week found not guilty, a verdict applauded by supporters in the public gallery. 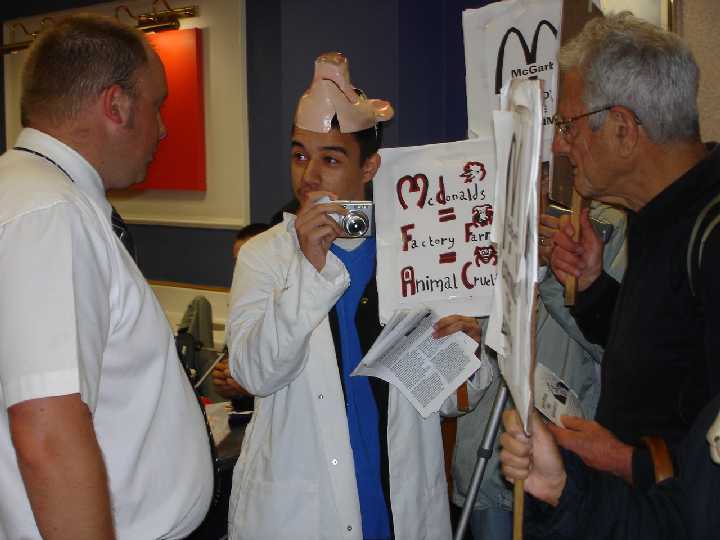 In June 2008, protesters entered the Cambridge restaurant and informed customers on a range of issues regarding McDonalds corporate practices. One of the campaigners was then arrested under Section 5 of the Public Order Act for not giving his date of birth to police (Videos: 1 | 2 | Pictures). The protest was in commemoration and on the anniversary of the now famous 1997 McLibel court case that was a huge public relations disaster for the multinational. The activists highlighted the issues originally comprised in the leaflet that led to the court case, including animal farming and environmental degradation, calling on people to boycott the restaurant chain. Could this also go under Health (due to the bottom quote), as well as ecology, animal liberation and globalisation. Thanks.